In my continuing quest to become an astronaut, I wanted to figure out what the "typical" astronaut's background is like, so I mined the NASA astronaut bios for information. I was interested in the educational, military, selection age, and spaceflight histories of the astronauts, so I focused on that information. I think the plots below speak for themselves, but if you'd like the raw data or have questions, please feel free to ask. Note that I only compiled information on NASA's 126 active and management astronauts. I didn't include the Payload Specialists, former, or international astronauts, although I might go back later and add them to the analysis. 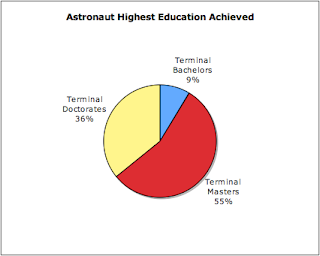 I learned that only 36% of astronauts have earned doctorate degrees, but most of the astronauts selected with only a masters or bachelors had extensive NASA and/or military experience. 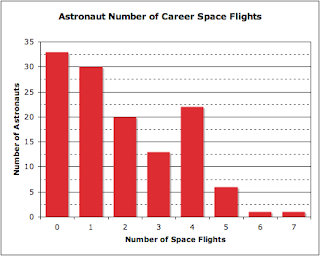 The typical astronaut has one bachelors and one masters degree, although some do have more than one of either type of degree, with the most being 2 bachelors and 3 masters. Some other tidbits of note are that 4 astronauts have MBAs, 1 has a DVM, and only 1 has a MD/Ph.D. 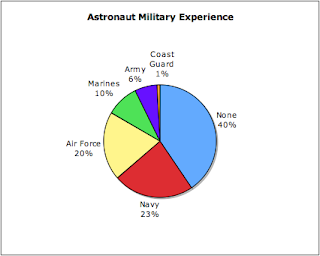 I suspect the percentage of astronauts with military experience would go up if I included the larger pool or former astronauts too, since in the pre-shuttle era, nearly all astronauts were military. However, the current pool has a 60/40 split, meaning it's still beneficial to have a military background, but it's not a must. 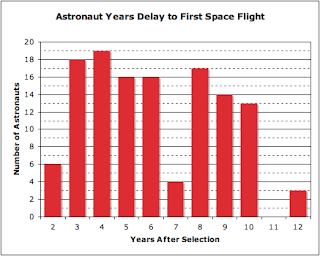 I think the four histogram plots are really interesting because they address the age of astronauts when they're selected compared to the age when they actually get to fly into space. 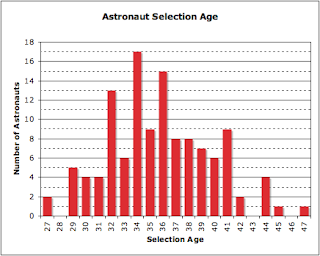 Most astronauts are selected when they're in their 30s and get to fly several years later. Some astronauts have been eligible for flight assignment for over a decade but have still not been assigned. A few of them have risen to management positions and might never get to fly. I can see why someone like Peter Diamandis would get disillusioned with the NASA astronaut program and strike out on his own to spark the personal spaceflight revolution. After all, the chances of getting selected are very slim, and even if you are selected, you might not even get to go into space. If you do, you might have to wait several years and will only get go up a few times at best during your spaceflight career. 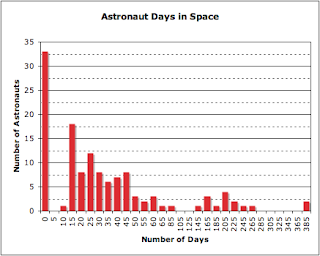 Note that the last plot of number of days in space would be a lot different if I included cosmonauts too, since they have much more long duration spaceflight experience. I love charts. Sounds exciting. I wish you would create an rss feed so I can subscribe to your blog. You can use a service like feedburner.com... it's free. I was looking at the blogger options for a way to add RSS to my blog but didn't see the option. I'll look into how to link it up with feedburner because I agree with you that life is much better with RSS feeds. Apparently the Navy has decided not to support NASA as strongly as it has in the past. They are now restricting the number of naval applicants. At least it means it will be a little less competition for us, right? No, I hadn't seen that NY Times article. Thanks for sharing! Great post, I love these stats and would appreciate a deeper analysis with the excluded dataset. I thought all blogger blogs had the RSS setup by default. You're right that all Blogger posts have that Atom post built-in. I just didn't realize it at the time that I originally made this post. A few weeks ago I added Blogger's new "Subscribe to this blog" feature to my blog, and it includes the URL you shared. It's such a good thing that they were able to show that kind of information that helps them in gaining something useful and informative that could help a lot of people in using this as one of their tool or technique in learning. Do you think it is possible to get yourself selected in an astronaut program if your CV includes only a Merchant Marine Academy degree and a commercial airline pilot career, plus the knowlege to speak three foreign languages including russian, greek, spanish?